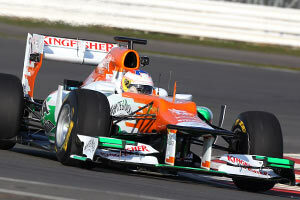 Sahara Force India presented their VJM05 at Silverstone on 3 February, after which it immediately began a shakedown. The car was shipped later that day to go to Jerez in order to begin winter testing. To reflect the confidence the team has in its car, the team's technical director Andrew Green pointed out at the launch: "We have a lot more confidence in the aerodynamics we put on the car now, compared to previous years. I think that showed from the time we changed the car in Barcelona and for the rest of the season. We were putting updates on at almost every race and the performance was improving." "We’re happy with the strategy we’ve got and we’re pushing the boundaries even further. So we’re going to use what we learned last year as the foundation. There’s been a bit of clawing back to do with the exhaust regulations and that’s been the main focus of attention over the winter. And so far the performance in the tunnel has been encouraging. It’s just that unknown of where everyone else is – and we won’t know that until Melbourne." After turning around their design philosophy for the VJM04, this time the team continued with development of its existing concept, albeit quite drastically. For starters there is the front wing, which is now a completely different design after developing the same wing for 2 years. While the trailing end of the endplates are certainly interesting and complex, perhaps the most curious feature is the shaping of the leading edge of he wing's flaps. As these are now profiled, they overlapped the base plane of the wing. To resolve this, the team cut out the overlapping parts from the base element, making it now smaller than ever. This could well provide aerodynamic benefits, but it will almost certainly enable the designers to make the front wing flex a little bit more under high loads. With two large pillars, similar to what can be seen on both last year's and this year's Ferrari, the wing is connected to the crocodile nose. The team continued with a Red Bull-alike rounded bottom of the nosecone and monocoque to allow as much air as possible to flow under the car. The sidepods still feature the same sidepod panel alongside the inlets, but now feature a dramatic undercut, further reducing drag that is induced by the sidepods. At the top of the car, the team also dropped the blade design and went for a more traditional airbox. The new design however features a large undercut, requiring additional supports to make sure the rollbar is strong enough to protect the driver in case of a crash. Many teams are going this route since a few years, and it is not unthinkable that the structure incorporates metallic parts, just like LRGP have done in 2011. Towards the rear, the car retains the pull rod rear suspension. The new exhausts are positioned where they were expected to be, fairly close to the centre of the car, and blowing in an upward angle. This was expected to be seen on many cars at introduction time, but Ferrari and McLaren have already shown that several variations are possible. The VJM05 turned out to be a consistent racecar, often recording points finishes. Nico Hulkenberg secured the best result of the year by finishing 4th in the Belgian GP. Force India ended the season 7th on the constructors' championship with 109 points. Chassis: Carbon fibre composite monocoque with Zylon legality side anti-intrusion panels. Front suspension: Aluminium uprights with carbon fibre composite wishbones, trackrod and pushrod. Inboard chassis mounted torsion springs, dampers and anti-roll bar assembly. Rear suspension: Aluminium uprights with carbon fibre composite wishbones, trackrod and pullrod. Inboard gearbox mounted torsion springs, dampers and anti-roll bar assembly.